Herman M. Jacobs was born around 1835 in either Germany or Poland, probably in Posen or another area that had recently been taken over by Prussia. Herman Jacobs arrived in the United States in 1858. He was was naturalized in 1868 in Storey County, Nevada District, which has its county seat in Virginia City. 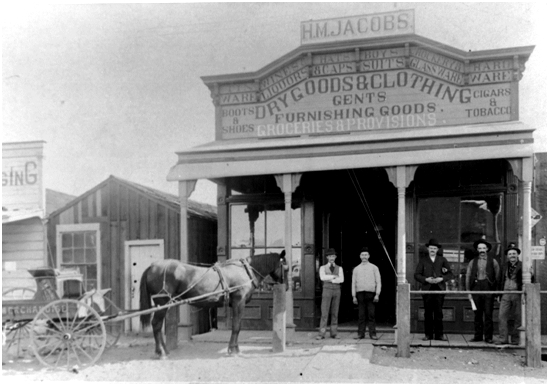 Jacobs was a general merchandiser in Virginia City, Nevada, and in the California towns/cities of Bodie, Sacramento, San Francisco, and Fresno. Herman Jacobs later arrived in Tehachapi in the Antelope Valley. There he opened his dry goods store: H. M. Jacobs General Merchandise. 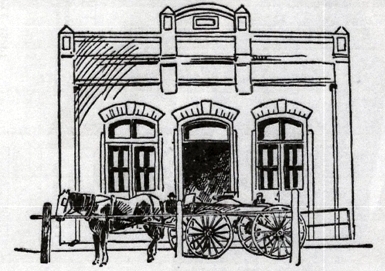 When Jacobs opened a second store, he probably became the first to own a chain of stores in the greater Antelope Valley. Herman Jacobs also served as a Notary Public, offering his services throughout the Valley, and especially helping people with their wills. There were no synagogues in Tehachapi or the greater Antelope Valley at this time, so Jacobs would travel north to nearby Bakersfield or via train (2-3 hours) south to Los Angeles. In 1873, Herman Jacobs married Minna Kirschbraun (or Kirschbaum) in Carson City, Nevada. Together they had two daughters: Esther and Lizzie. Herman Jacobs passed away in 1912 and was buried in the Hills of Eternity Memorial Park in Colma, just south of San Francisco. Minna Jacobs is probably buried in Omaha, Nebraska, where she moved after Jacob’s death. Norma Gurba-Kleit is curator of this Herman M. Jacobs exhibit.